I was able to use fronts & backs of the shirts as well as the little emblems that are above the front pockets. I also used small designs on the sleeves. Quite fun! This quilt was quilted with Superior Thread, Rainbow, Gypsy which is a bright pink variegated thread. 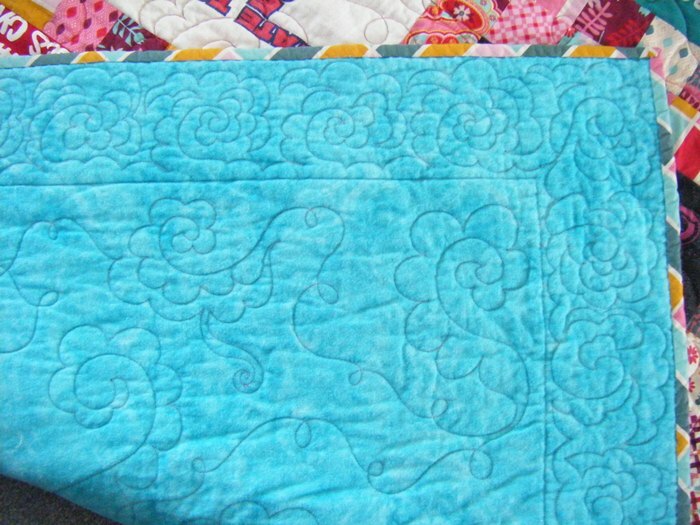 Here is a photo of the back showing the turquoise flannel backing and the quilting. I used a freehand floral design in the border and then a variation of that with swirls for the body of the quilt. Let me know if you’d like me to make a tshirt quilt for you. Of course, the price varies depending on the size you want and the number of shirts. 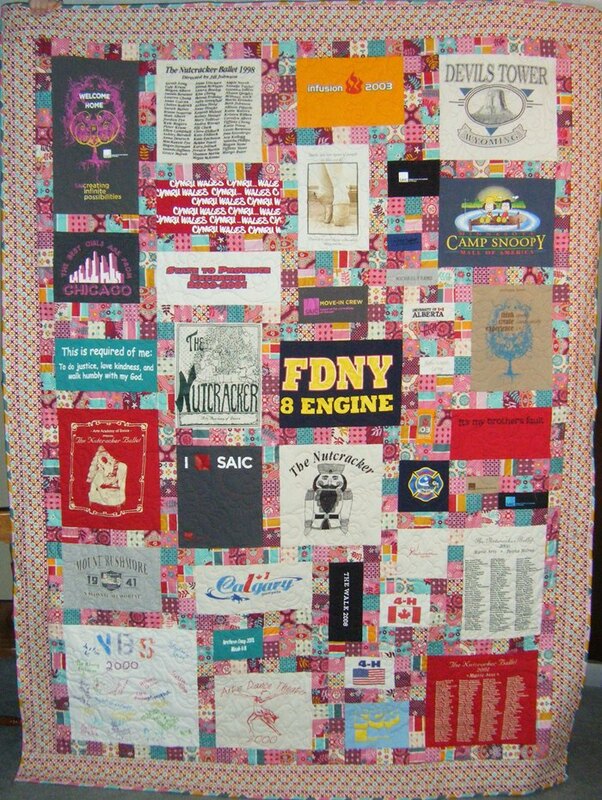 Awesome new rendition of a t-shirt quilt, Joyce! Bet your daughter loves it more & will treasure it always! Love the quilt, Joyce. I guess I like bright colors, too; they really pop on this quilt. As a mostly non-quilter, but having sewn quite a bit in my lifetime, what do you do to keep the t-shirt material from stretching and looking weird? Anyway, great job!! I’ll bet K loves it, too! This is great!!!! My daughter has already requested one, but as a BEGINNING quilter, I will need inspiration, YOU inspire me!! !